Explanation: Wraithlike NGC 6369 is a faint apparition in night skies popularly known as the Little Ghost Nebula. It was discovered by 18th century astronomer Sir William Herschel as he used a telescope to explore the medicinal constellation Ophiucus. Herschel historically classified the round and planet-shaped nebula as a Planetary Nebula. 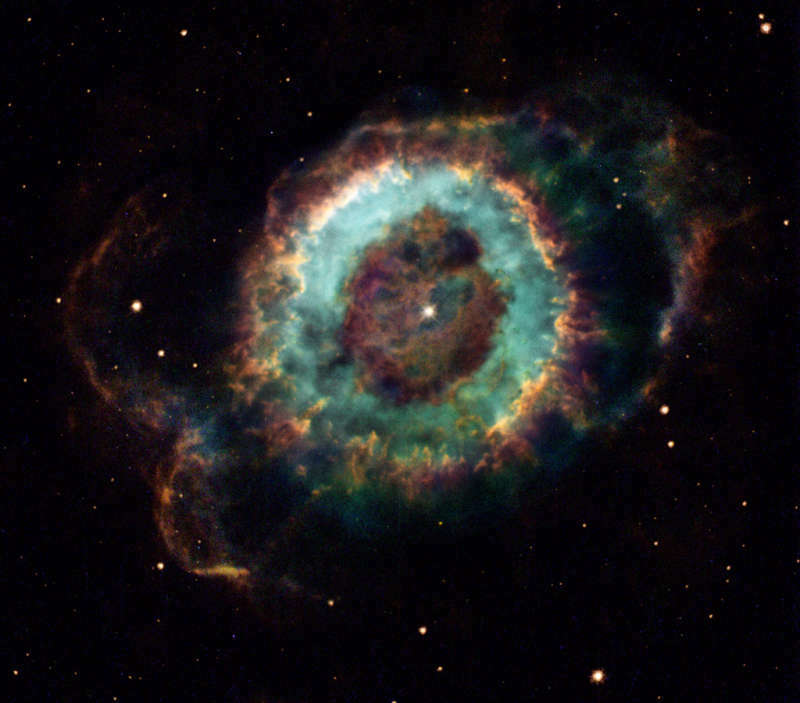 But planetary nebulae in general are not at all related to planets. Instead they are gaseous shrouds created at the end of a sun-like star's life, the dying star's outer layers expanding into space while its core shrinks to become a white dwarf. The transformed white dwarf star, seen near the center, radiates strongly at ultraviolet wavelengths and powers the expanding nebula's glow. Surprisingly complex details and structures of NGC 6369 are revealed in this tantalizing image composed from Hubble Space Telescope data. The nebula's main round structure is about a light-year across and the glow from ionized oxygen, hydrogen, and nitrogen atoms are colored blue, green, and red respectively. Over 2,000 light-years away, the Little Ghost Nebula offers a glimpse of the fate of our Sun, which could produce its own planetary nebula about 5 billion years from now.